Da Nang (VNA) - The central city of Da Nang has rushed to complete a traffic-easing tunnel project at one of the city’s busiest roundabouts before the APEC Economic Leaders’ Meeting begins on November 5. 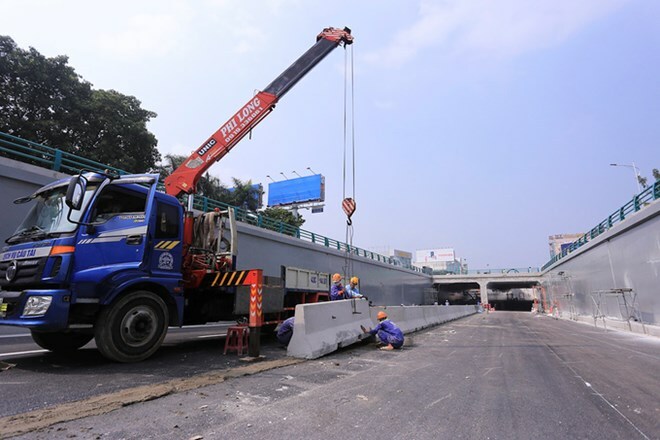 Work on the tunnel at the junction of Dien Bien Phu, Nguyen Tri Phuong and Le Do streets began 11 months ago, according to the city’s managing board of Priority Infrastructure Projects. The 220 billion VND (9.77 million USD) road tunnel project, part of the city’s World Bank-funded sustainable development project, will replace the current ground-level intersection with a system of 160m-long open air tunnels and 80m underground tunnels. It is now technically complete, though not yet open to traffic. There will be two lanes for Bus Rapid Transit along with another two lanes for other vehicles. It’s the city’s second such road project after a tunnel at the West Han River bank traffic intersection commenced construction last October, and one of the key projects in the city’s strategy to promote public transport and a Bus Rapid Transit (BRT) network. Nguyen Huu Tuan, deputy general director of Thuan An construction and trading joint-stock company, a contractor of the project, said the tunnel’s opening will take place ahead of the APEC Economic Leaders’ Meeting, which the city is hosting for the first time. “We have completed the technical inspection before opening for traffic. We revved up the construction schedule to complete the project in time before the APEC meeting,” Tuan said. “We had some items delays, but labourers worked through the nights to finish the tunnel early,” Tuan said. The city also plans to build a metro, tramway, and underground and sky train between 2020 and 2030. With a population of one million, Da Nang’s current public transit system is not meeting the needs of local residents. Only 1 percent of the 2.5 million daily journeys in the city are made by public transport. Da Nang, the third largest city in Vietnam, has invested in urban development to become the largest city in the central region and a green city by 2025, with funds from the World Bank. In 2013, the World Bank agreed to provide 202 million USD for a 272 million USD sustainable development project to help build the city’s Bus Rapid Transit network, lay new roads and revamp the drainage system. The bank also funded a five-year priority infrastructure project for the city, by covering 70 percent of the total cost of 218.4 million USD. The APEC 2017 Economic Leaders’ Week with major events in Da Nang city and Quang Nam province is an external focus of Vietnam between now and 2020.